Expanding texts, one label at a time. Text expansion — it's real, apparently! But if you're like us, you must be scratching your head now, asking yourself "what is text expansion and does it have legs?" In short, a text expansion app like Texpand for Android helps you save time by assigning shortcuts to your most frequently used texts, and it works in almost any text-entering application you'll encounter. In the app's free version (paid costs $2.99), you can define up to 10 phrases and have them show up inside floating bubbles that let you quickly insert a phrase (even if you forgot its shortcut), or immediately undo it. 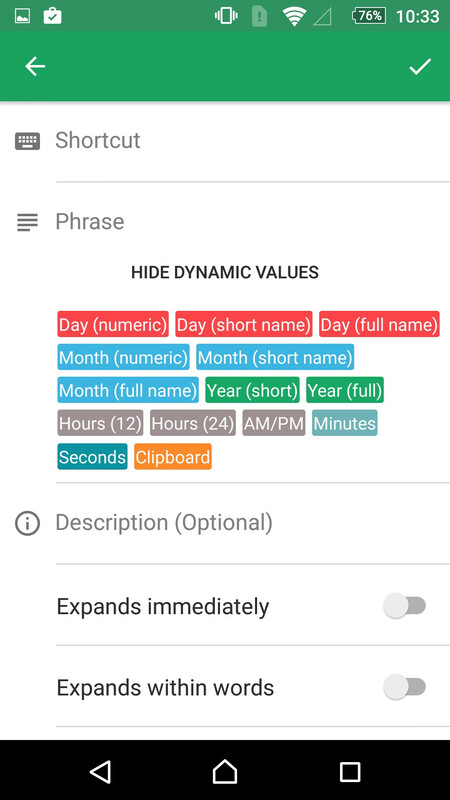 There are also dynamic values to let you insert date and time in several formats, as well as per-phrase options to expand text immediately after adding a space, or expanding in and between words. All this text expansion stuff is contained within a very approachable user interface that feels consistent, but also suffers from information bloat. There's a lot of scrolling and checking different options out to be done inside Texpand's menus, although that doesn't really get in the way of using it. Moreover, the developers claim that their app is compatible with software keyboards and physical Bluetooth keyboards alike, and also does text phrase backup to Google Drive or your local storage. So, how many texts will you expand today? Text aide has a pretty similar feature. iOS stock keyboard does this... I use it for emails, addresses, and ofcourse frequent phrases. I can start typing "12.." and it instantly shows "1234 Main Street, Big City, CA 54321" just hit [space] and it's filled... I thought android can do everyone iPhones can and more!